ohw that's not expensive at all. I've asked around over here, but there wasn't any available under 100 euro's... and that was a rather small one too. I'm not going to spend a lot of bucks on the EFF con, because I'm still kind of wondering how it will turn out (since it's not a comic con, and I have a hunch that they have put us somewhere all the way in the back ) but I'll definitely look into it for possible future con's thanks! Honestly eBay is your best option for these things if you don't want to pay massive prices. I'd suggest looking up "roll up banner" and making sure the description includes them printing the image etc. But I'd also suggest looking up wire storage cubes, they're handy as shelving or backing displays and they fold down easily. Both are available via eBay for less than £30. Even the roll up banner stands are cheap if you know where to look, as I've said before - I got my latest one from ebay £30 included shipping and printing. Don't buy things like that from big firms like Staples though as they charged me £100 for my first one (plus £15 for "5 minutes work" as it said on the receipt). Which really isn't that impressive, I really need to redesign it properly for the big events this year. I commandeered my school's large-format printer so mine was way cheaper than it should be at "free." I need to get a better tablecloth though. Muninn: the company in the netherlands I linked in the tablecloth thread does banners pretty cheaply ... 12 eur per square meter for heavy duty banners. I painted my poles, but then they did not want to stick together evenly after I did it. So I probably won't try that again. I painted my poles with the set-up already assembled. I don't paint where the pole is stuck into the joint-thingies. 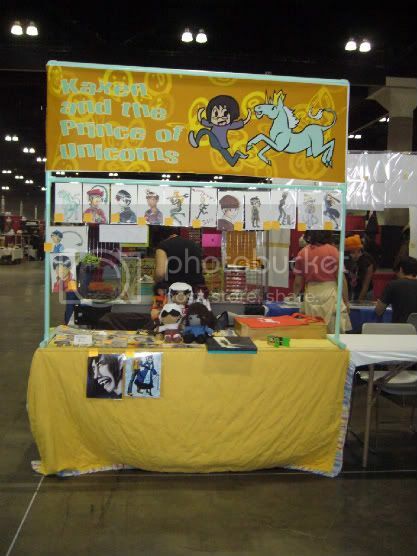 ...I'm also the only person at AX with a giant green unicorn on my banner. @_@' GREEN! IT'S A GREAT COLOR (though unfortunately CMYK printers can't handle sea foam green). Best convention display I've ever seen is by Doctor Geof creator of the webcomic Fetishman, the Steampunk Literary Review, and of course, The First Tea Company where I am currently ranked as Cakey-Major w/Cake (previously Brew-Tenant Colonel w/Ocelot)... I have a swanky ID/warrant card to prove it and everything. If you want a simple cosplay MLP seems like your best bet. (Not familiar with the series but I've seen a lot of pony cosplayers around.) Sherlock seems like something that would be most effective as a group (since the clothes tend to be mostly modern and fairly simple), while Korra and asscreed would require patterning and constructing an entire costume from scratch. One thing I suggest if you use PVC pipes to make your table display: paint them. (or wrap them in ribbon or something). For some reason, nearly everyone at AX uses white PVC poles which I think looks icky especially when it stills has those prints on the side from the factory. I have seafoam green painted PVC poles. It's much more memorable. I was talking to a guy about AX and he asked which table I was and all I had to say was "the one with the green pipes" and we were talking some six months or so after the convention which I assume is decent amount of time to forget things. So I think that's pretty good recognizability. Guh, I need to cosplay. Last-last year, I cosplayed Czes from Baccano and then managed to drag some of the cosplayers from the Baccano cosplay meet over to my table. That sold a couple buttons. For you European people: Connecticon used to pay for your table, then hotel room, then airfare depending on how much traffic you got from your comic (they called it tiers). Lem, who does Bunny, was flown in from England and put up one year. However, I don't know if they're still doing that. They've made some major changes to how webcomics (now called Online Media) are being handled and there is currently no information on what these changes actually entail. I've e-mailed all the people supposedly involved, some more than once, over the past month and I've only heard back from Joe Calloway (who is the awesome guy on staff) about it. All he can tell me is webcomics won't be in the Artist Alley anymore and I should talk to the Online Media guy who doesn't e-mail me back. Haha! But CTcon has always been mismanaged like this. I know that in the UK it's possible to get events to pay for your transport and hotel (and get a free table) if you're invited as a guest. The only way to become a guest is to send the organisers emails offering to do workshops and panels for them. Some accept this, others don't. I keep jokingly saying that I should get a group of UK creators together and email US events offering our services if they shoulder a large enough portion of the expenses (hotel, transport, shipping). Also, MCM in the UK usually provide creators who have exhibited at their events previously first claim on tables at their events. Normally their new events have free tables for the first year, those that book and turn up get first claim on all tables at that event from then on. Those who book and don't turn up, can't get a table for the next years event(s).